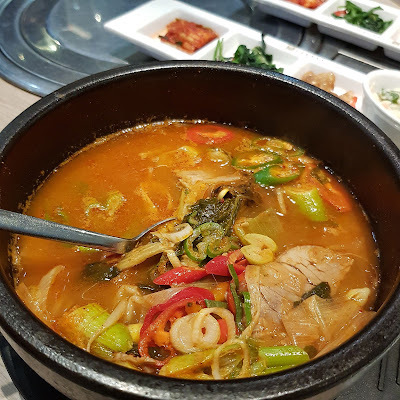 Hansang Korean Family Restaurant is a restaurant offering authentic Korean Cuisine established by a Korean family in 2007. The Koreran family had moved to Singapore several years ago prior to 2007 and was unable to find authentic korean food in Singapore. Hence, this restaurant was started. 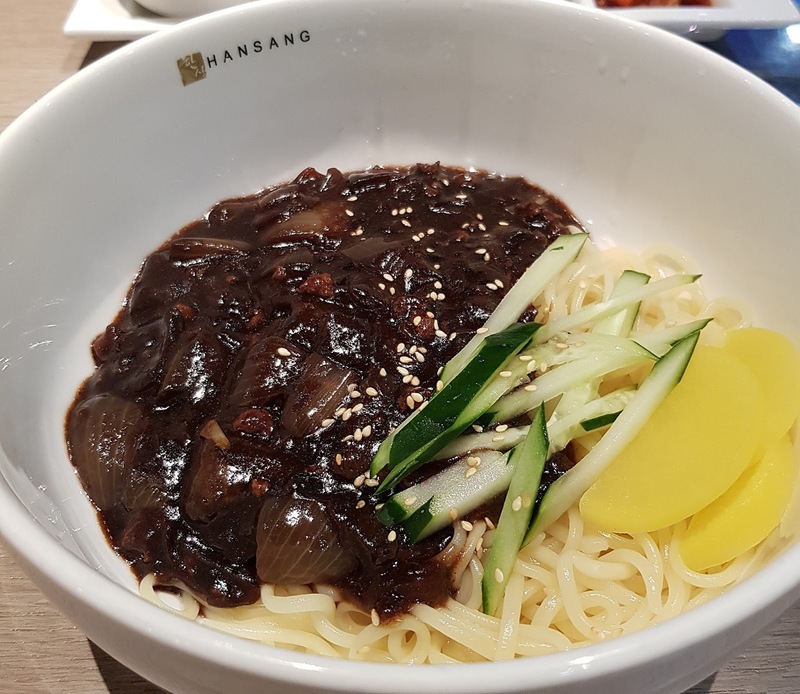 The name of the restaurant "Hansang" means “a table full of food all the time” as the aim was to share the diverse cuisine of Korea with everyone. Hansang Korean Family Restaurant currently has two outlets; at Square 2 and Holland Village. We visited its outlet at Square 2 in Novena. Interestingly, the restaurant also offers catering services! 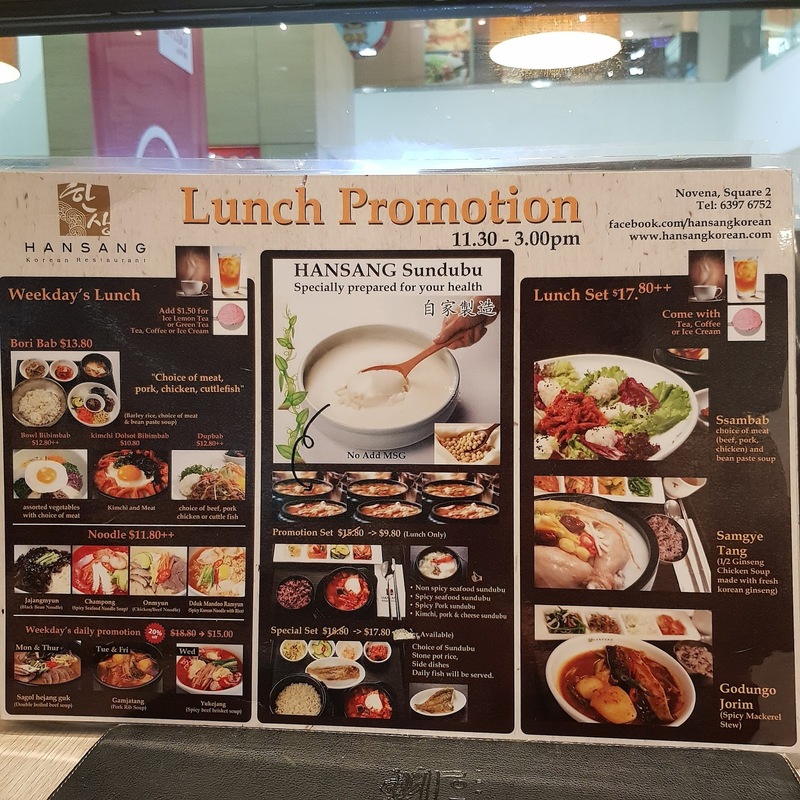 Their lunch time promotion is value for money! This is the Sagol Hejang Guk (Double Boiled Beef Soup) $15. This was very well executed. The broth which was spicy, was so tasty and flavourful! Moreover the beef slices were tender and the beansprout provided a crunchy texture. It was so good that we indulged endlessly into it and drank every single bit of the broth. This is a must try! A video of the dish and the side dishes. 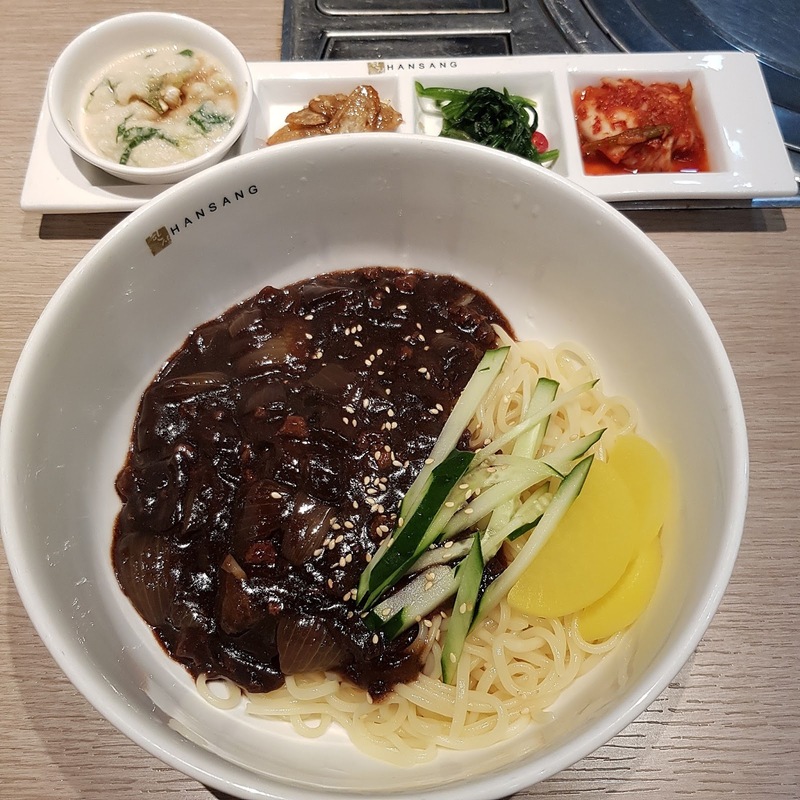 The Jajangmyun (Black Bean Noodle) $11.80, is a dish which most people are familiar with. This is the korean version of Chinese black bean noodle. You can easily get this in any Korean restaurant or food eateries, but it is hard to find one that is good. Hansang's one is damn good! When it first arrived, I was quite skeptical as the portion looks small and ordinary. But wow, I was impressed when I tasted it. The black bean sauce which is a make or break factor for this dish was perfect. The sweetness and savouriness were well-balanced. There was no bitterness after taste, which you may encounter at other eateries (the bitterness is from the black bean paste). Moreover, minced meat and caramelised onions were mixed in the sauce. This is another must try! On another occasion, we ordered the Samgyetang (Ginseng Chicken Soup) $17.80. This is a nourishing soup common eaten in summer in South Korea to the replenish the nutrients lost from sweating. 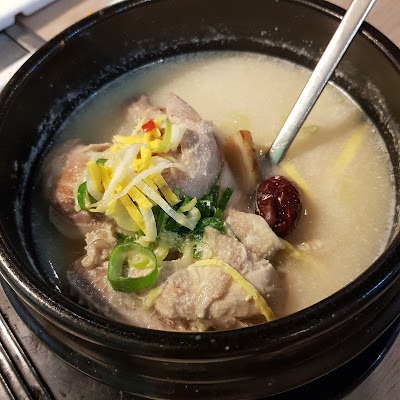 The Samgyetang is my kind of comfort food. The broth was flavourful. Interestingly, inside the chicken, besides a small slice of ginseng, there was also a gingko nut. The chicken meat itself was folk tender. The Champong (Spicy Seafood Noodle Soup) $11.80, is quite an interesting dish. 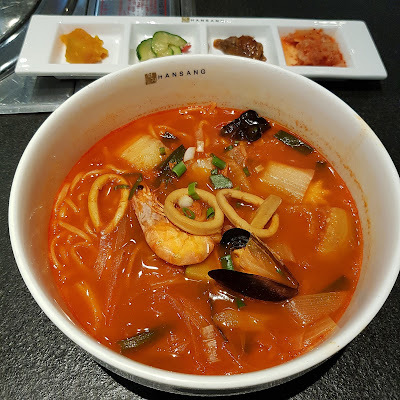 The broth was spicy yet so addictive! Slurping down the noodles with the broth is bounded to ignite your taste buds! 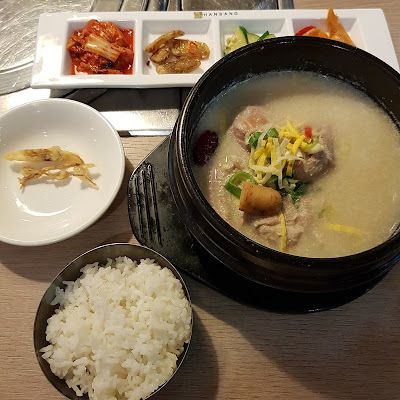 I have been to Hansang Korean Family Restaurant a few times and I must say that their food sure is good! 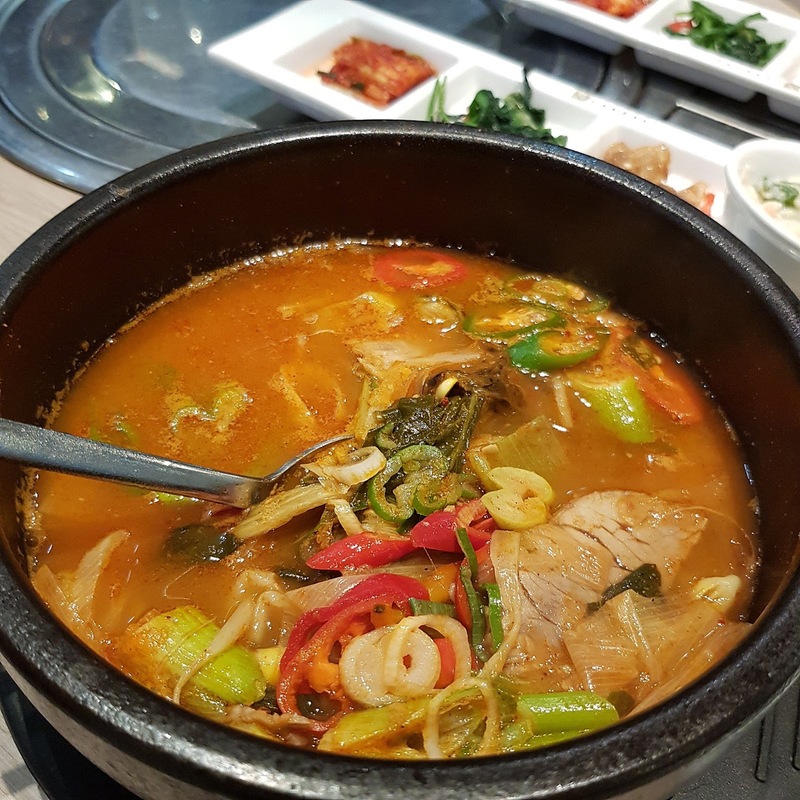 If you are looking for somewhere with delicious Korean food, look no further!